Do you know how to answer the question, “What classes do I need if I want to major in..?” on your own? The answer can be found in Catalyst by running a “What-if” Report. 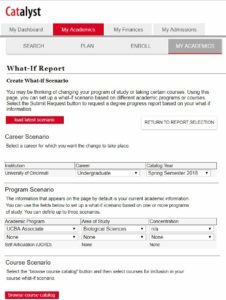 Learn to utilize this hidden feature known as a “What-if” Report, found within UC’s Catalyst interface, with the help of this user-friendly guide. 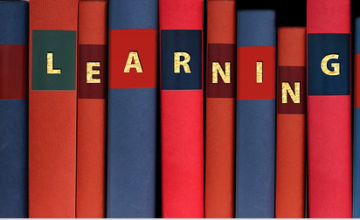 Using online resources are necessary for a wide range of student activity such as registering for classes, corresponding with professors, and interacting with course material. Students need to feel supported by online resources, as they provide immersive interaction throughout all levels of an academic career. This guide contains sections providing useful tools and features found within Catalyst. These advanced functions can help any student make informed decisions about their academic career and retain a sense of empowerment about their future. 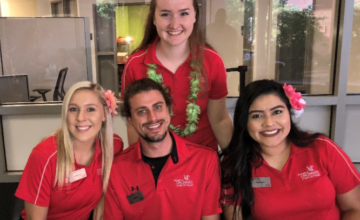 Simply log-in to Catalyst using your UC login (6+2 & password) and once logged refer to the “Academics” tab and left-click to bring up your academic information. Now, found on the far bottom-left of the page you will find a drop-down titled “Degree Audit.” Once expanded you will see the Run a “What-If” Report feature. By opening the “What-If” Report page, you will be presented with a screen that shows the necessary link to CREATE NEW REPORT. 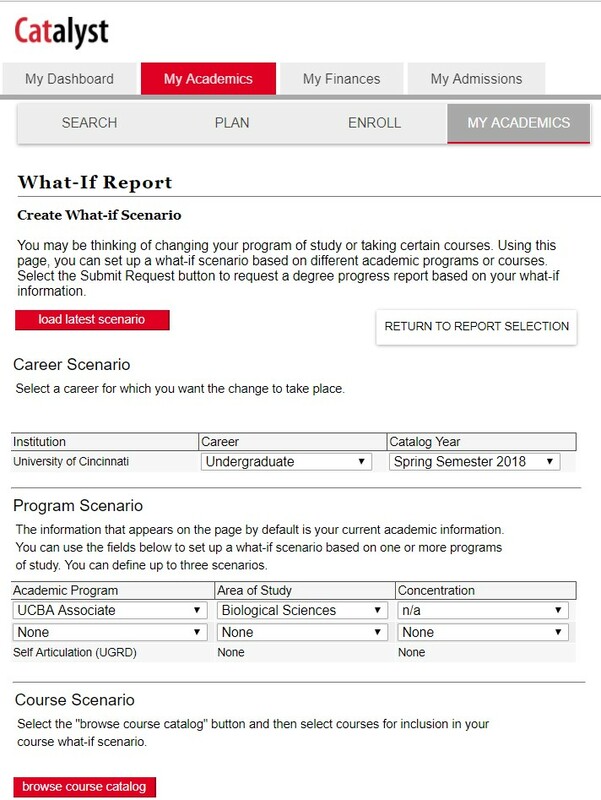 Once you enter the “What-If” Report interface you should notice several drop-boxes under the heading Career Scenario and Program Scenario. The Career section allows you to select the career you are looking to adjust. 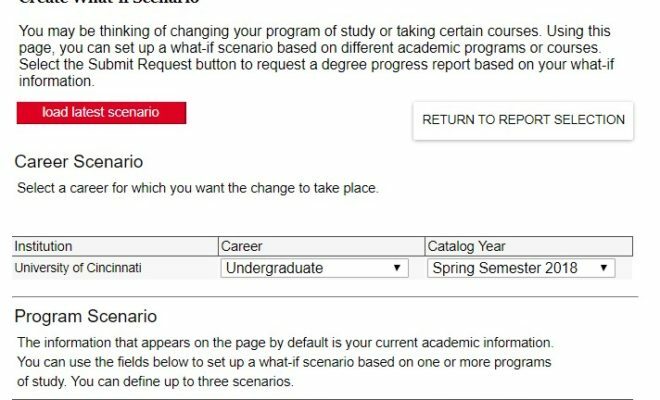 The Program Scenario section is the area that you will select your hypothetical major of interest. 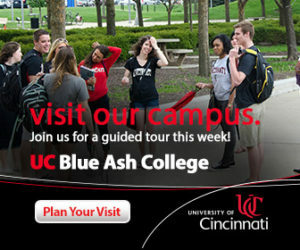 You are able to define up to three scenarios from virtually any area of study offer at UC. If you simply want to browse the catalog of offered programs, you may click on the red bar titled “browse course catalog” and select an available program. Once your selections have been made, click on the “SUBMIT REQUEST” box, found in the lower, right-hand corner of the page. You will now be redirected to your newly generated “What-If” Report. 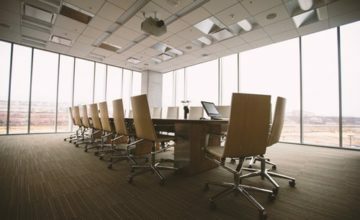 Found in this report are all the requirements needed to obtain completion of your selected programs and what credits you currently have that fulfill these requirements. This page can be viewed again through the Run a “What-If” Report page. Although you may not need your Academic Advisors consent to enact changes to your academic career path, it is recommended to meet with your advisor before altering your course schedule. This will ensure that you stay in compliance with all course requirements without any accidental set-backs. For a quick reference of the sequence of links used to generate a “What-If” Report see below.